An aging body can pose a number of challenges, from fading eyesight to mysterious aches and pains. That’s true for pets as well as people. But getting up in years doesn’t mean we are doomed to a life of pain and weakness. The saying “use it or lose it” rings true, whether you have two legs or four. I recently received an email from a reader with an 11-year-old Akita who is experiencing weakness in her hind legs – a common affliction among older dogs. She has some arthritis in her knees, and her back legs shake when she stands or urinates. Her owners are treating her with medication, supplements and laser treatments. They also keep her active with several walks a day, and do exercises with her. They want to know if they are on the right path. I turned to my friend and colleague Dr. Evelyn Orenbuch, who is board-certified in veterinary sports medicine and rehabilitation. 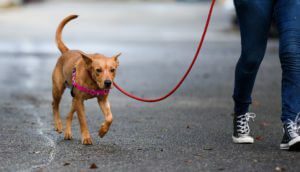 She is the owner of Georgia Veterinary Rehabilitation, which recently joined BluePearl, and is a leader in the field of rehabilitation for aging and ailing pets. Dr. Orenbuch says that when treating an older pet, one of the most important things to do is have a veterinarian conduct a thorough assessment of where any sources of pain may be located. While a dog may have arthritis in her knees, it’s not uncommon for the back to be the true pain point. Also, the pain source can move and shift over time. That’s why Dr. Orenbuch will do a re-assessment of her patients every two to three weeks. Dr. Orenbuch says she takes a multi-modal approach to treating pain. She, along with the other members of her staff, is certified in animal chiropractic and acupuncture. So in addition to medication, she will also frequently prescribe supplements and herbs for her patients. Also, it’s important for older pets to keep moving! While this Akita gets a good deal of exercise, that’s not always the case for aging pets. Old or obese pets may be reluctant to exercise on their own, and owners may be hesitant to force them. That starts a terrible downward spiral, Dr. Orenbuch says. 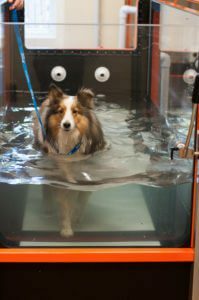 As a veterinarian board-certified in rehabilitation, she has a variety of tools at her disposal at her facility to help coax pets back into shape, including a pool, an underwater treadmill and a gym. Patients initially see her once or twice a week, as well as work with their owners every day at home. Once they begin showing signs of progress, they may only need to visit once or twice a month. So how do you find a rehabilitation facility for your pet? Dr. Orenbuch suggests visiting rehabvets.org and handicappedpets.com. You can typically find a facility somewhere within your state. It may sound like extra work and expense, but physical rehabilitation can add to your pet’s longevity as well as quality of life. Thank you so much for the valuable information, Dr. Orenbuch! We hope this helps our Akita owner, as well as all of the other parents who are dealing with aging pets. Keep warm, everyone. We’ve got some cold weather tips for you and your pets here. Hopefully, a spring thaw is right around the corner.